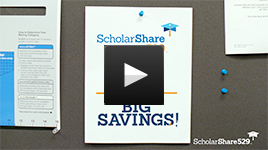 The program is ScholarShare 529 Workplace Savings. It is a direct deposit program, so all you have to do to participate is assign a payroll slot. What sort of companies participate? More than 900 companies offer the ScholarShare529 Workplace Savings Program, from high-tech giants, global media companies and leading-edge hospitals to small businesses, state agencies, counties, cities and special districts. Similar to 401(k) plan benefits, more and more companies are offering employee 529 plan contribution matches. Whether or not your organization offers this, your employees will still truly appreciate being able to participate in the Workplace Savings Program. Will Your Employees Really Care? Feel companies that offer a Workplace College Savings Program care about their employees.